Eileen becomes the Ramsays' housekeeper. Des tells Julie there's been an accident. Des goes on to tell Julie that it's Philip Martin who's been in the accident. She is shocked and immediately resolves to go and see him, asking Des to cover for her at the bank. DES: Julie, hang on. Just take it in before you rush off and do something. JULIE: No, Des, I'll have to go and see him, I'd never forgive myself. Des offers to drive her to the hospital - Willowsby General. Helen is sketching Eileen. They have a cuppa and Eileen moans about how messy Danny Ramsay is. She thinks all the Ramsay men are like children. Julie comes in through the back door and tells Helen what's happened. Helen manages to get rid of Eileen and then tells Julie that she must be careful - Phil's wife might be at the hospital. Julie doesn't care. Julie is pacing the corridors waiting for news about Phil. There's no news, but it turns out that Loretta was in the accident too - she's also in the accident. They don't know where the children might be. Eileen tells Max to stop poking about in the fridge - she'll get anything he wants for him. She starts ranting about Danny scibbling "obscenities" on her whiteboard, but it turns out that "I want to drink your blood" is a film that Danny's gone to see. Eileen asks Max if she can invite George over and he isn't very keen. Julie is still waiting when Jim arrives. There's no news about whether the children were involved in the accident, and no news about Phil and Loretta either. The nurse comes up and advises Julie to go home, but she refuses. She's made up her mind. Eileen is bothering Des by doing some impromptu cleaning and getting in the way of the cricket on TV. She probes Des for details about what's happened to Julie, but he won't give anything away. Eileen is stunned to hear that Sarah is staying with Des but Des reckons that Eileen's squabbles with Sarah's mother are nothing to do with him. The nurses have now changed shifts. The new nurse tells Julie that Phil is improving a bit, and she'll try to get her in to visit him soon - after all, she's waited for such a long time. Max is moaning to Jim and Helen about Eileen. He asks them if he can stay to dinner to avoid George! Eileen comes in and drags Max home for dinner. On the way out, Lucy says that she knows Julie is visiting Philip Martin. HELEN: You have very big ears, young lady. LUCY: I know. They come in handy when you're small! 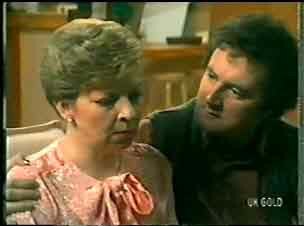 Helen tells Jim that she feels a bit sorry for Eileen. HELEN: She's a very lonely old woman. LUCY: Danny says she's an old bat. Helen and Jim try not to laugh. Max and Eileen are waiting for George to arrive (he's late). When George finally gets there he apologises profusely and tells Eileen a tragic story about a malfunctioning traffic light. Max rolls his eyes. 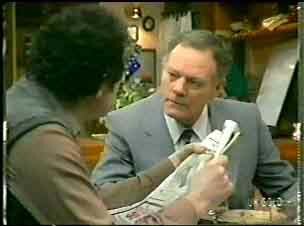 As they sit down for dinner, Max tries to immerse himself in his newspaper, but George is determined to tell him how overworked Eileen is. George is leaving and kisses Eileen on the cheek. Max is watching a comedy and George gives him a death glare. Jim is sitting up, very worried about Julie. Helen gets up and sits with him. Jim reflects on how much Julie has grown up, but he has to learn to let her go. Jim finally gets up to go to bed, leaving a light on for Julie. Phil is much better and Julie is very relieved. However, the doctor has some more news - Phil's wife Loretta has just died. DOCTOR: I'm very sorry. How well do you know Mr Martin? Do you feel up to telling him? What I mean is...would you prefer me to do it? She slowly enters Phil's room. Phil is lying on the bed with a tube over his nose. As melancholy music plays, Julie approaches the bed. Phil is awake. PHIL: You didn't have to, you know. Loretta...how is she? JULIE:(faintly) Um... I'm sorry Philip. Loretta died just a little while ago. PHIL: I think I already knew. It seems that Debbie and Michael weren't in the car - they're staying with a neighbour called Mrs Finn. But apparently the neighbour is hopeless. Phil doesn't know what will happen now Loretta is gone. PHIL: They're going to need so much loving and caring. I need your help, Julie.